There are countless reasons to quit smoking: doing so will lower your risk of cancer, heart attack, and stroke, and—let’s be honest—make your breath smell better. Unfortunately, millions of people continue to smoke simply because quitting is incredibly hard. Hard, but doable: According to the CDC, the number of former smokers has exceeded the number of current smokers since 2002. Just a week after quitting, you’ll find that your energy levels, breathing, and sense of smell and taste have improved. Long term, you’ll be less susceptible to colds and flu, you’ll experience less smoking-related anxiety, your risk of heart attack, stroke, and colon cancer will drop significantly, and for men, erectile dysfunction issues can improve. After 15 years of smoke-free living, your risk for smoking-related illnesses (such as heart disease) will be the same as a nonsmoker. It’s time to stop smoking now. Increase your odds of success with these 10 tips. First and foremost, you need to want to quit. Most people make multiple attempts to quit and fail because they’re not psychologically ready. Think about your reasons: Did you just become a new parent? Did you lose someone to a smoking-related illness? Are you just tired of letting cigarettes control your life? There’s no question that smoking is bad, but what does that mean to you? Identifying real reasons can help you stick to your plan and hold yourself accountable. Like having a training partner increases your likelihood of adhering to your fitness goals, finding someone with a similar health goal like quitting smoking can help you stick with it. Partner up with someone else who wants to quit and support one another. Talk to everyone in your social circle and make your intention to quit smoking clearly. Did you know that quitting is contagious? A Harvard study found that people quit smoking in groups, sometimes creating a “quitting cascade” that spreads from person-to-person within a social network. Set a quit date that’s not too far in the future and stick to it. Setting a start date marks the authentic initiation of an action plan. It’s a tangible, immediate goal as opposed to tapering your smoking over the course of several months. Talk to your health care provider about quitting. He or she can refer you to licensed counselors who can coach you through the process from recognizing the habits and triggers around your smoking patterns to offering support when you’re tempted to give up or fall off the wagon. Several studies have found that counseling and follow-up from a doctor improve quit rates. Stress is one of the most common triggers for cigarette cravings. Finding alternate ways to cope with stress is a good first line of defense against nicotine pangs. Start a practice such as meditation, yoga, or counseling to build long-term coping mechanisms. When you feel anxiety or stress coming on at the moment, try 4/7/8 breathing—focus on your breath and breathe in for four counts, hold for seven, and exhale for eight counts. Repeat for a total of 10 breaths. This can help level your mood when you’re overwhelmed. A study found that graphic cigarette warnings had a positive impact on quit rates. Utilize this demotivational technique by printing out images and facts about the dangers of smoking and placing them in places you’d usually smoke, such as your car or on your front porch. Nicotine replacements have proved time and again to increase the likelihood of success. Nicotine gum, lozenges, patches, sprays, and even lip balms can help curb your cigarette cravings and offer distractions from the oral fixation that comes with smoking. The jury’s still out on electronic cigarettes or e-cigarettes, and research doesn’t point to them being an effective way to quit smoking. However, they can be an alternative if you aren’t quite ready to quit but want to make a transition. From an overall health perspective, e-cigarettes may be less harmful than cigarettes, but there still isn’t enough research to say definitively. Disrupt the oral aspect of your smoking habit by chewing gum or eating mints. Something as simple as drinking water can be a useful tool in breaking the habit as well. Bringing the glass to your mouth provides a way to keep your hands and mouth busy. It can also combat any weight gain associated with quitting smoking. Nicotine is an appetite suppressant, and quitting can lead to an increased appetite. Drinking water can keep both food and cigarette cravings at bay. If you believe in it, it can work for you. Alternative therapies like hypnosis and acupuncture don’t have substantial proof of efficacy as a cessation aid, but if you’re ready to quit, connecting with a modality that you trust it can be effective. While not a first-line option, these therapies can help keep you on track to hitting your goals. 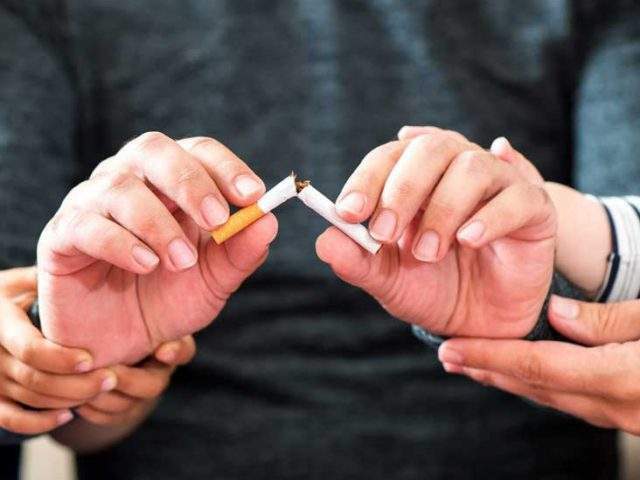 A Dutch study about the success of different smoking cessation methods found that prescription medications like Zyban (bupropion) and Chantix (varenicline) are highly effective for smoking cessation. If cold turkey or over-the-counter options aren’t working for you, talk to your provider about quitting using one of these medications. Make sure to mention any health issues or other drugs you’re taking to ensure these prescriptions are safe for you. The decision to quit smoking is an easy one; it’s the follow-through that’s challenging. But outlining an action plan to help you break the habit will improve your chances of success greatly. Stopping smoking is one of the most impactful actions you can take for your health!